What does Moon Man mean? Moon Man is a character used in racist memes and associated with the alt-right. No recurring YTMND character represents this more than the repurposed "Moon Man," liberated from his YouTube hell into a looping GIF that spews racist and homophobic hatred from atop a Big Mac. Yeah, it's weird. Where does Moon Man come from? 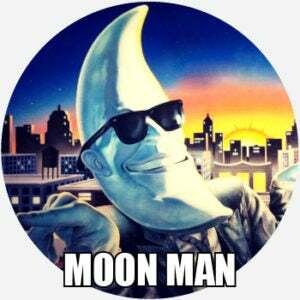 The imagery later used in Moon Man memes originates in a series of 1980s McDonald’s TV commercials. They feature a character Mac Tonight, a jazz pianist in a black suit and sunglasses on his head, which is a giant crescent moon. To the tune of Bobby Darin’s “Mack the Knife,” Mac Tonight sings about eating at McDonald’s. His name also puns on the fast-food chain’s signature burger, the Big Mac. The character appeared in dozens of commercials from 1986 to 1997, and was briefly revived in a 2007 ad in Singapore. Also in 2007, a user named farkle on the social website YTMND uploaded a GIF of Mac Tonight paired with the reggaeton song “Chacarron,” known for its gibberish lyrics. Another meme uploaded soon after used the same image and a robotic voice to praise farkle (in lewd and homophobic terms) and his creation, calling the character Moon Man. Another Moon Man video later in 2007 used text-to-speech software to make the character appear to repeatedly chant “KKK.” Subsequent memes from then on tended to characterize Moon Man as a racist. During the 2016 presidential election, the Moon Man meme was adopted by Trump supporters on the alt-right. One group of Trump supporters raised funds for a billboard featuring Moon Man and a hybrid of Donald Trump and Pepe, the cartoon frog mascot of the alt-right. Videos featuring Moon Man were then published on YouTube with titles like “WhiteTopia,” “Gas the Kikes,” and “Right Wing Death Squads.” Many of these videos have since been removed under YouTube’s policy against hate speech. The earliest examples of the Moon Man meme were motivated by dark, absurdist, or nostalgic internet humor, but the meme was quickly appropriated for racist jokes in an internet-self-referential manner. By 2016, as noted, Moon Man was embraced as a full-fledged far-right icon. There are still some un-bigoted uses of the original Mac Tonight footage, including a music video edited to a vaporwave song by Saint Pepsi. That video, however, has been removed from YouTube due to the strong associations between Mac Tonight and his white supremacist spawn, Moon Man. Due to these associations, both Mac Tonight and Moon Man are considered extremely offensive. Moon Man is not to be confused with the name used for the trophy given at the MTV Video Music Awards.